An excellent gift idea to make a nice surprise for someone, allowing her or him to choose a gift from the range of jewelry in our store. The Gift Voucher is a pre-paid card, which is the equivalent of cash, allowing you to buy goods in the ANGEL BRIGHT online store www.angelbright.pl The Gift Voucher is valid for a period of six months from the date of purchase. Finalizing the Gift Voucher. The Gift Voucher is a one-time-use voucher. If you buy items of greater value than the Gift Voucher, you may pay the missing amount . When you order for a lower amount than the value of the Gift Voucher, then the unused amount can not be used later. Finalizing of the Gift Voucher is simple and intuitive. The recipient of the Gift Voucher, ordering the chosen jewelery, enters the code on the order summary page in the field "VOUCHER CODE "(the code is located on the reverse of the Gift Voucher) and in <the message for the Seller> gives the first name and the last name of the person who purchased the Gift Voucher. The order is automatically paid. You can buy Angel Bright Gift Vuocher in two ways: 1. The purchased voucher is sent to the e-mail address of the Buyer in electronic form. It can be printed (preferably in color) and handed to the recipient. Shipment by email - PLN 0 2. The purchased voucher is sent to the address indicated by the buyer in the "delivery address" field. We send the Gift Voucher in the form of a colorful elegant card in a decorative envelope. Shipping by post or courier according to the option chosen by the buyer. Beautiful, eye-catching pendant and earrings in silver-graphite. Carefully braided with luxurious Swarovski crystals of excellent cut quality. Extremely impressive and shiny jewelry !!!! MATERIALS: Swarovski crystals 14mm, 16mm and 4mm, TOHO beads in silver and graphite colors. Earrings and pendant are hanging on sterling silver elements. MEASUREMENTS: Earrignsand Pendant: 5,5cm without silver elements. EXTRA OFFER: We offer earwires to choose from: open earwires, closed English (shape like in the picture) and studs with hanging earrings. Earrings can also be ordered on clips. Please let us know in a message during purchasing the product. Beautiful, eye-catching necklace in violet and light peach. Carefully braided with luxurious Swarovski crystals of excellent cut quality. Extremely impressive and shiny jewelry !!!! MATERIALS: Swarovski crystals 18mm, 16mm, 14mm and 4mm, TOHO beads in silver and light peach colors. Necklace closure ended with a lobster lock and extender chain - sterling silver. MEASUREMENTS: Necklace length: 42cm plus 4cm of extender chain. EXTRA OFFER: You can order a necklace to the specified measurements. FREE service! Beautiful, eye-catching necklace in silver-graphite. Carefully braided with luxurious Swarovski crystals of excellent cut quality. Extremely impressive and shiny jewelry !!!! MATERIALS: Swarovski crystals 18mm, 16mm, 14mm and 4mm, TOHO beads in silver and graphite colors. Necklace closure ended with a lobster lock and extender chain - sterling silver. MEASUREMENTS: Necklace length: 42cm plus 4cm of extender chain. EXTRA OFFER: You can order a necklace to the specified measurements. FREE service! 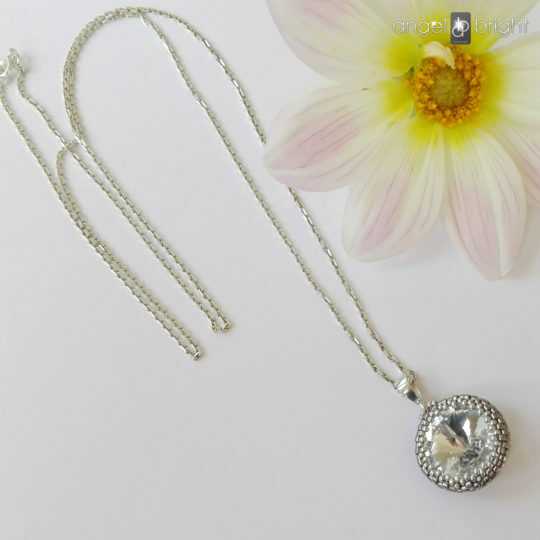 Elegant pendant made of sterling silver, luxurious Swarovski crystal of excellent cut quality and tiny Toho beads in silver shades. Fashionable, comfortable and impressive jewelry! Beaded Swarovski crystal, with sterlig silver hanger attached plus silver chain. MATERIALS: Swarovski crystals 18mm, TOHO beads in silver colors, sterling silver hanger and chain. MEASUREMENTS: Pendant diameter: 22mm. Chain lenght: 50cm EXTRA OFFER: You can order a chain to the given lenght. Beautiful, eye-catching necklace in blue. Carefully braided with luxurious Swarovski crystals of excellent cut quality and fine Chech crystals. Extremely impressive and shiny jewelry !!!! MATERIALS: Swarovski crystals from 22mm to 14mm and Chech crystal beads 4mm, TOHO beads in blue and sapphire colors. Closure ended with a lobster lock and extender chain – sterling silver. MEASUREMENTS: Necklace Lenght: 42cm EXTRA OFFER: You can order a necklace to the specified measurements. FREE service! . 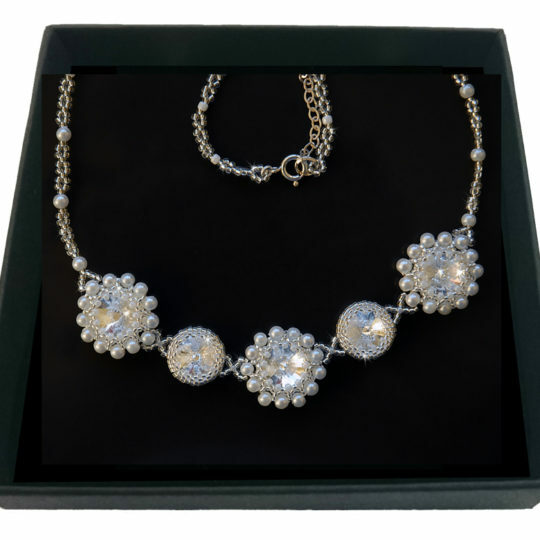 Beautiful, eye-catching necklace in crystal white. Extremely impressive and shiny jewelry !!!! MATERIALS: Balls made of semiprecious stone - an ice crystal with the diameter from 20mm to 8mm and satin silver balls 4mm. Closure ended with a lobster lock – sterling silver. MEASUREMENTS: Necklace Lenght: 55cm plus extender chain – sterling silver. EXTRA OFFER: You can order a necklace to the specified measurements. Beautiful, eye-catching necklace in white. 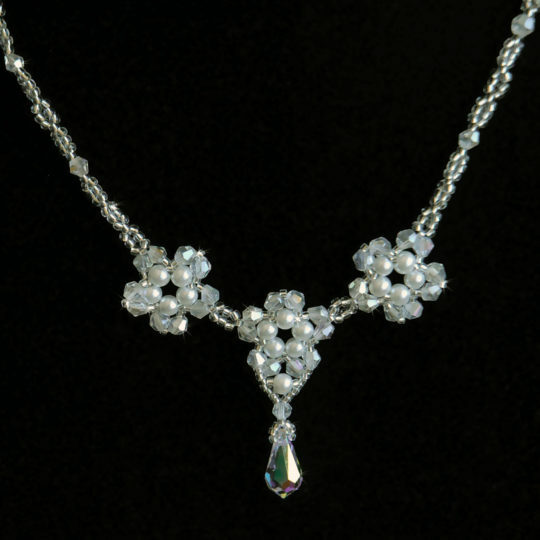 Carefully braided with luxurious Swarovski crystals of excellent cut quality and white pearls. Extremely impressive and shiny jewelry !!!! MATERIALS: Swarovski crystals 14mm and white pearls 4mm, TOHO beads in silver and white colors. Closure ended with a lobster lock and extender chain – sterling silver. 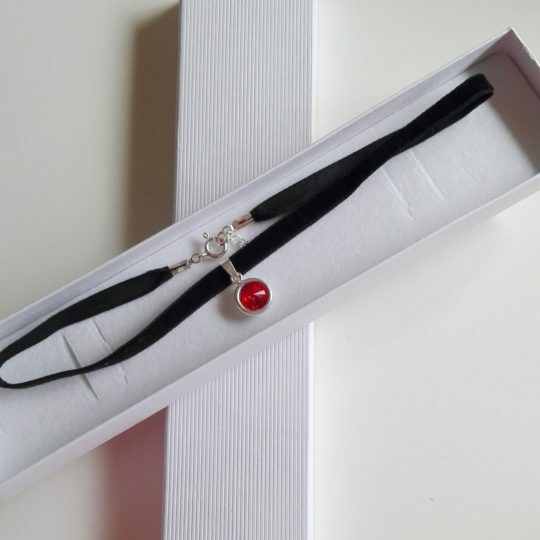 MEASUREMENTS: Necklace Lenght: 42cm EXTRA OFFER: You can order a necklace to the specified measurements. FREE service! . Beautiful, eye-catching necklace in white. Carefully braided with luxurious Swarovski crystals of excellent cut quality and white pearls. Extremely impressive and shiny jewelry !!!! MATERIALS: Crystals (transparent) in a diamond shape with AB effect and white glass pearls with a diameter 4mm, hanging drop 1,5cm long, Toho tiny beads in silver colors. Closure ended with a lobster lock and extender chain – sterling silver. MEASUREMENTS: Necklace Lenght: 42cm EXTRA OFFER: You can order a necklace to the specified measurements. FREE service! . 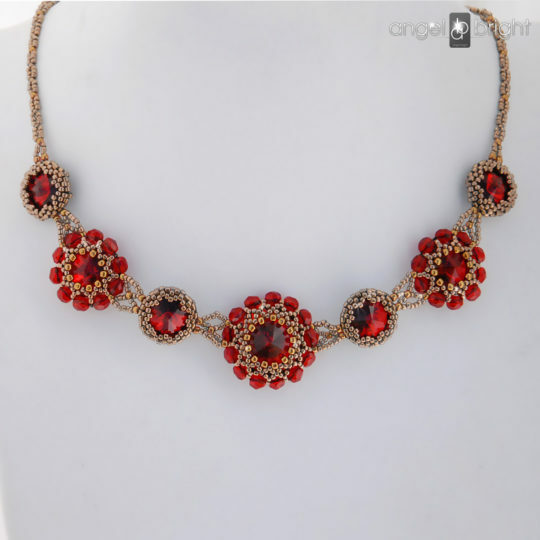 Beautiful, eye-catching necklace in dark red. Carefully braided with luxurious Swarovski crystals of excellent cut quality and fine Chech crystals. Extremely impressive and shiny jewelry !!!! MATERIALS: Swarovski crystals 18mm, 14mm, 12mm and Chech crystal beads 4mm, TOHO beads in dark gold colors. Closure ended with a lobster lock and extender chain – sterling silver. MEASUREMENTS: Necklace Lenght: 42cm EXTRA OFFER: You can order a necklace to the specified measurements. FREE service! . Unique pendant made of fascinating stone - Tiger Eye. Carefully woven into the shape of a developed flower. 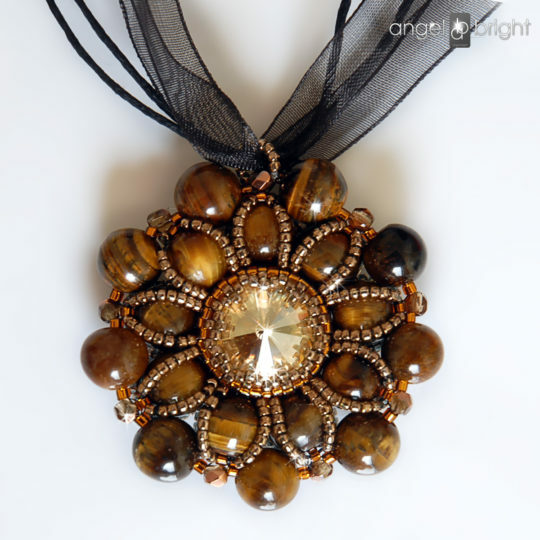 Tiger Eye stone has been woven with dark gold tiny beads and crystals, which adds splendor to the whole pendant. Perfectly matches the decolletage neckline and turtleneck sweaters. Extremely impressive and shiny jewelry !!!! MATERIALS: Swarovski crystals 14mm, TOHO beads in gold colors, Chech crystals. MEASUREMENTS: Pendant diameter: 4,5cm. EXTRA OFFER: You can order a chain of beads to the given lenght. Please contact us. 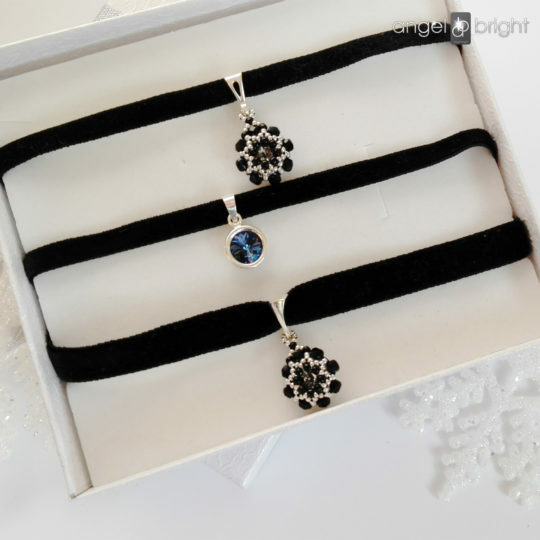 Unique pendant made from practical Onyx stone carefully woven into the shape of a developed flower. 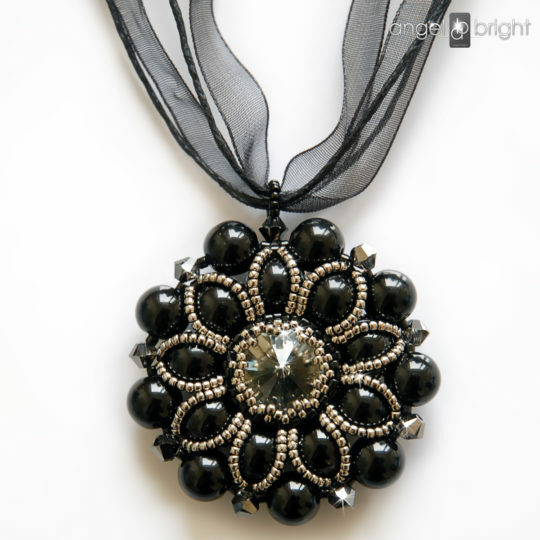 Onyx has been highlighted with silver, tiny beads and crystals, which adds splendor to the whole pendant. Perfectly matches the decolletage neckline and turtleneck sweaters. Extremely impressive and shiny jewelry !!!! MATERIALS: Swarovski crystals 14mm, TOHO beads in silver colors, Chech crystals. MEASUREMENTS: Pendant diameter: 4,5cm. EXTRA OFFER: You can order a chain of beads to the given lenght. Please contact us.